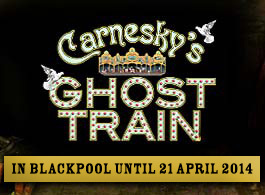 The seminal standalone work which is Carnesky’s Ghost Train is set to haunt the borders of art and entertainment for one last time on Blackpool’s Golden Mile for two weeks over Easter. After ten years of occupying the unique space that blends artful theatrical installation with a stunning, spooky and magical ghost train, the ride will be closing the hatch on its border control for good. 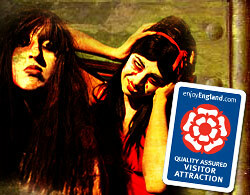 After spending 2004-2009 touring the UK and Europe, Carnesky’s Ghost Train was in danger of grinding to a halt. It was a very expensive show to tour involving high-end illusions, a cast of 17 and 50 metres of specially built track. “It was like touring with your own theatre venue and would take a week to erect each time” says Marisa Carnesky, the award-winning artist behind the work. In 2009 to Carnesky’s great surprise and joy Blackpool Council suggested that they wanted to take on the art piece as a permanent tourist attraction on the Golden Mile. Open throughout the season in all winds and all weathers, Carnesky’s Ghost Train went on the receive over 18,000 visitors a year and proving to be a big hit not only with the thousands of holidaymakers who stumbled across it but also with those whose traveled to Blackpool specifically to experience the unique ride. Carnesky ran annual workshops for local young drama students and provided work and drama training for over 70 young people across the ride’s five-year residency. The performers who have worked on the ride are devastated to see it go. They are not only losing their jobs but the opportunity to work on a show that offers participants a more meaningful and affecting experience than the average scare attraction or conventional theatre outing. 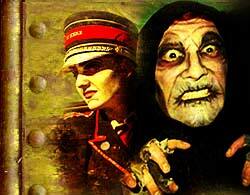 To celebrate this ambitious artwork that breached the gap between art and entertainment and changed the Blackpool entertainment landscape forever, Carnesky Productions will be holding a two week finale from 12-21st April 2014, giving the public the chance to take one final, frightful ride on Carnesky's Ghost Train. Carnesky will then commence touring selected original facade paintings, statues, instillations, sets, carriages, costumes, flyers, posters, programmes, sculptures, artworks and illusions that have featured in the ride in the form of an interactive exhibition in galleries across the UK, to be announced. Also featured in the exhibition will be a specially commissioned film by filmmaker and ex-member of the Ghost Train cast, Harry Clayton-Wright. 'Combining a cultural classy edge with a lot of enjoyable screaming, Carnesky's Ghost Train is a passionate tribute to war scattered refugee ghosts. It was a success in London and is now even better, both more serious and more fun'.